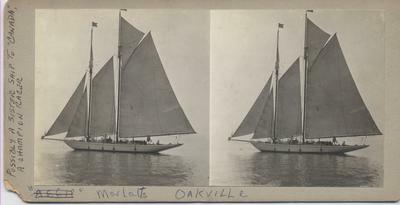 Unpublished stereoview labeled MARLOTTS Oakville, of a two-masted yacht possibly sailing in Lake Ontario, off Oakville. There is a uniformed crew forward and at the helm, with a man in a jacket and tie standing near the stern. "Marlotts" Oakville "Possibly a sister ship to "CANADA" a champion racer."